Lonnie Wheatley, KANSAS CITY, Kan. (October 21, 2016) – Brad Sweet returned to the site of what likely ranks as his first major victory on Friday night and the result was the same, as the Grass Valley, CA, native came away with a hard-fought win in the 30-lap “Rumble the River” main event atop the ½-mile Lakeside Speedway clay oval. It was just over ten years ago in August of 2006 that a little-known Sweet suddenly became quite widely known when he took the $10,000 winner’s share in the non-wing Sprint Bandit TNT feature event at Lakeside. 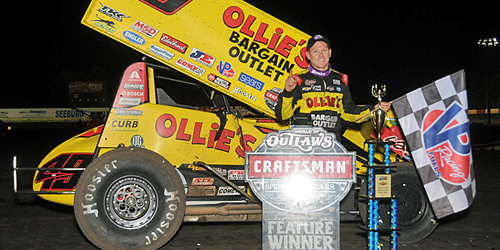 “That was the probably the biggest win I had at the time, this place is good to me,” Sweet said after taking Friday night’s $10,000 Craftsman World of Outlaws triumph aboard the Ollies Bargain Outlet No. 49, his eighth of the year. Sweet battled past Joey Saldana on the 13th circuit and then survived one final restart with eleven laps remaining to beat Kasey Kahne Racing teammate Daryn Pittman to the stripe with Logan Schuchart making a late rally from tenth to fill out the podium in third. “This is pretty neat, to have a KKR sweep of 1-2,” Sweet commented. While Sweet started the feature from the pole position after a daring slider past Ian Madsen to win the Dash, he spent the opening dozen laps as the role of chaser as Brother of Madman gunned into the early lead. Madsen’s command lasted just four laps though, as Joey Saldana went to the extreme upper portion of turns three and four to race by both Sweet and Madsen for the lead. Following a wild turn three flip by quick-timer David Gravel after seven laps, Sweet went to work on Saldana. Saldana, vying to become just the sixth driver to ever record 100 career WoO feature wins, worked the top side while Sweet kept surging on the bottom. Sweet’s persistence paid off with a slide into the lead exiting turn two on the 13th lap. Sweet survived another pair of cautions, getting a good jump on the final one and then withstood a late charge from Pittman that fell just short. 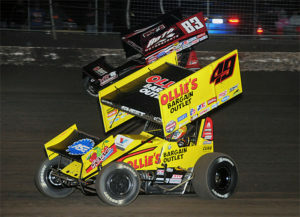 Schuchart progressed as the race went along and took the show position with Saldana in the final handful of laps. Saldana settled for fourth while Shane Stewart shook off the effects of a rough early portion of the night to rally from 19th to fifth after winning the “B” Main. Quick Time: One of the last to hit the lightning-fast half-mile, David Gravel stopped the clocks at 13.704 seconds. Heat Winners (starting position in parentheses): David Gravel (1), Brian Brown (2), Daryn Pitman (1). Heat Moments: After Matt Covington knocked a left rear tire down on the opening lap of the first heat, Tasker Phillips tested the turn three wall several laps later; Jason Johnson jumped Shane Stewart’s right rear turn three and took a hard flip into the wall on the opening lap of the second heat; Getting another strong run from the fourth starting position on the restart, Stewart raced past Brad Sweet for second but caught the wall exiting turn two and limped to a stop with rear issues; The only heat to go incident free, Kerry Madsen fought off Donny Schatz in an entertaining battle for third. Dash Winner (starting position in parentheses): Brad Sweet (2). Dash Moments: After a pair of Brian Brown cautions, Brad Sweet slid past Ian Madsen on a lap two single-file restart to earn the pole position for the “A” Main. “B” Main Moments: Tasker Phillips was unable to make the call after his heat race mishap while the “Ragin’ Cajun” tagged the seven-car “B” in a back-up; Never able to clear the gremlins from the powerplant, Glen Saville was the odd man out when he had to call it quits in the opening handful of laps. 3 laps – Jason Johnson slows with a cut right rear tire. He rejoins and charges back, nearly into the top five before an askew nose wing costs him several positions in the final laps. 5 laps – Matt Covington slows and calls it a night. 7 laps – Battling among the top five, David Gravel takes a wild ride in turn three. He walks away from the carnage. 15 laps – Among the top ten early, Paul McMahan slows. 19 laps – Throwing his heat into the lead mix after the previous caution, Brian Brown ends up with front end damage against the turn three wall. “A” Main Hard Charger: Passing but was plentiful in the feature event but nobody passed more than Shane Stewart, who raced from 19th to fifth. Qualifying – 1. 5-David Gravel, 13.704; 2. 49-Brad Sweet, 13.919; 3. 9-Daryn Pittman, 13.928; 4. 83-Joey Saldana, 13.993; 5. 21-Brian Brown, 14.010; 6. 18-Ian Madsen, 14.037; 7. 1s-Logan Schuchart, 14.066; 8. 41-Jason Johnson, 14.082; 9. 15-Donny Schatz, 14.097; 10. 7s-Jason Sides, 14.151; 11. 2-Shane Stewart, 14.196; 12. 17w-Kerry Madsen, 14.274; 13. 82-Sammy Swindell, 14.293; 14. 7-Paul McMahan, 14.300; 15. 1a-Jacob Allen, 14.339; 16. 7w-14.358; 17. 12-Lynton Jeffrey, 14.453; 18. 71a-R.J. Johnson, 14.510; 19. 09-Matt Juhl, 14.513; 20. W20-Greg Wilson, 14.527; 21. 2c-Wayne Johnson, 14.712; 22. 95-Matt Covington, 14.753; 23. 13-Clyde Knipp, 14.781; 24. 5J-Jeremy Schultz, 14.826; 25. 21-Kameron Key, 15.669; 26. 75-Glen Saville, 15.840. Heat 1 – (8 Laps – Top 6 finishers transfer to the A-feature) – 1. 5-David Gravel, 2. 83-Joey Saldana, 3. 7s-Jason Sides, 4. 1s-Logan Schuchart, 5. 82-Sammy Swindell, 6. 09-Matt Juhl, 7. 21-Kameron Key, 8. 7w-Tasker Phillips, 9. 95-Matt Covington. Heat 2 – (8 Laps – Top 6 finishers transfer to the A-feature) – 1. 21-Brian Brown, 2. 49-Brad Sweet, 3. 7-Paul McMahan, 4. W20-Greg Wilson, 5. 12-Lynton Jeffrey, 6. 13-Clyde Knipp, 7. 2-Shane Stewart, 8. 41-Jason Johnson, 9. 75-Glen Saville. Heat 3 – (8 Laps – Top 6 finishers transfer to the A-feature) – 1. 9-Daryn Pittman, 2. 18-Ian Madsen, 3. 17w-Kerry Madsen, 4. 15-Donny Schatz, 5. 1a-Jacob Allen, 6. 71a-R.J. Johnson, 7. 5J-Jeremy Schultz, 8. 2c-Wayne Johnson. 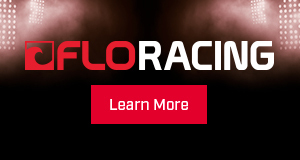 Dash – (6 Laps, finishing order determined first 6 starting positions of A-feature) – 1. 49-Brad Sweet, 2. 18-Ian Madsen, 3. 9-Daryn Pittman, 4. 83-Joey Saldana, 5. 5-David Gravel, 6. 21-Brian Brown. B-Main – (12 Laps, Top 6 finishers transfer to A-feature) – 1. 2-Shane Stewart, 2. 41-Jason Johnson, 3. 2c-Wayne Johnson, 4. 95-Matt Covington, 5. 5J-Jeremy Schultz, 6. 21-Kameron Key, 7. 75-Glen Saville, 8. 7w-Tasker Phillips (DNS). A-Main – (30 Laps) – 1. 49-Brad Sweet (1), 2. 9-Daryn Pittman (3), 3. 1s-Logan Schuchart (10), 4. 83-Joey Saldana (4), 5. 2-Shane Stewart (19), 6. 15-Donny Schatz (12), 7. 17w-Kerry Madsen (9), 8. 82-Sammy Swindell (13), 9. W20-Greg Wilson (11), 10. 2c-Wayne Johnson (21), 11. 41-Jason Johnson (20), 12. 7s-Jason Sides (7), 13. 09-Matt Juhl (16), 14. 1a-Jacob Allen (15), 15. 5J-Jeremy Schultz (23), 16. 71a-R.J. Johnson (18), 17. 13-Clyde Knipp (17), 18. 18-Ian Madsen (2), 19. 21-Brian Brown (6), 20. 7-Paul McMahan (8), 21. 5-David Gravel (5), 22. 12-Lynton Jeffrey (14), 23. 95-Matt Covington (22), 24. 21x-Kameron Key (24). Lap Leaders: Ian Madsen 1-4, Joey Saldana 5-12, Brad Sweet 13-30.